I wrote earlier about the increasingly visual nature of media and news in today’s society. The prior post focused mostly on photography, but there is another visual technique that has risen dramatically in prominence in recent years, particularly online – the infographic. Infographics aim to make complex data sets easy to digest and understand. An entire newspaper has risen to prominence due to the quality of its infographics. There are whole blogs dedicated to the subject. A good infographic can pack a lot of data into a small space and help the viewer to draw out a pattern or conclusion. However if the infographic is poorly or deceptively constructed, that conclusion may not be the same one you’d see if you examined the underlying data. While there are many great and useless infographics out there, I’d like to take a bit of time to focus on a couple deceptive ones. The first infographic I want to highlight comes from the otherwise excellent Political Math Blog. 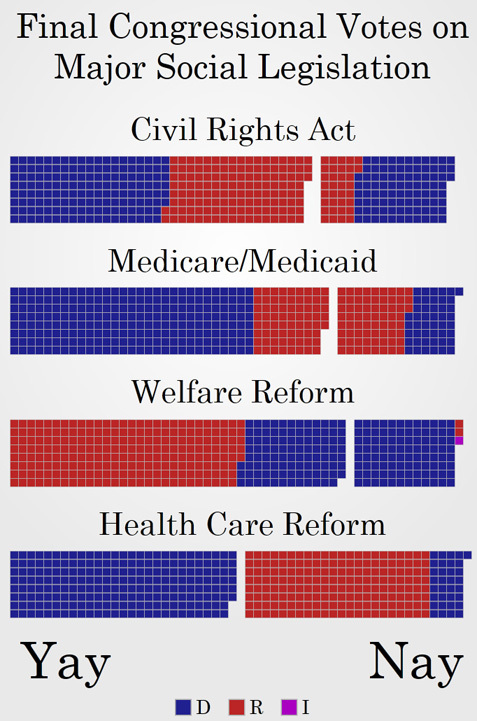 The diagram aims to portray the House of Representatives vote split for the recently passed healthcare reform legislation in comparison with the vote splits for other major social reform. It is an interesting diagram because it illustrates how objective information can be displayed in a manner that influences your perception of the data. In the first three vote blocks, the dividing line between “Yay” and “Nay” is drawn down the middle of the “split” party, indicating that there are party members on both sides of the debate. However, in the final vote block on heathcare reform, the creator of this diagram has specifically arranged the colors such that the Yay/Nay dividing line runs directly between the parties, with the dissenting Democrats hidden off to the right side. This increases the contrast between the parties, and makes the Heathcare Reform vote appear more partisan and divisive than it actually was. When viewing an infographic (or any seemingly “objective” data), make sure you consider whether or not the designer is trying to “lead” you toward drawing a specific conclusion or feeling a certain way by presenting the data in a certain manner. I originally found the next graphic on Digg, where people were whipping themselves into an outrage about how unfair life is, how capitalism is broken, and how America is headed to hell in a handbasket. Except this graphic is totally flawed (click for a full size version). This comparison completely neglects the other side of the household balance sheet – assets. You borrowed $250,000 on that mortgage to buy the house, so you also own an asset (the home) worth $250,000 (putting aside the housing crash for a second). You also have likely saved some of your income each year, which is building up as an asset in your bank account. Both of these assets can be liquidated to eliminate the debt. The debt is only dangerous if it is not matched by an asset of equal or greater value. In addition, the diagram assumes you never use any of the income you earn in the time between each bar (several years) to pay down any of the debt, yet you continue to borrow. If that’s the case, the prison is of your own making. I could go all day, but the bottom line is, this is a completely flawed comparison. Debt is not inherently a Bad Thing. Irresponsible debt (debt that is not counterbalanced by assets) is a Bad Thing. The lesson here is that you should pay attention to context and the validity of comparisons before drawing conclusions, especially when data visualization is involved. Infographics are incredibly useful for conveying a lot of data at a glace, and draw the eye with bright colors and interesting shapes. Often an infographic is the best way to communicate data to a relatively unsophisticated or novice audience. However, when you come across a flashy data visualization, sure the author didn’t create it to tell a specific story. Always take some time to envision the data behind the chart – would the data table create the same reaction that the infographic elicits? Update: Here is a great infographic that was sent over to me today by my friend Vanessa – it depicts the magnitude of the recent Deep Water Horizon oil spill that occurred last week in the Gulf of Mexico. It does an excellent job putting the magnitude of the spill in context with other well known spills (Exxon Valdez, Amoco Caldiz) and also illustrating just how much oil was spilled relative to the world’s daily consumption. Check it out. Even better, they make the underlying data available here. Great post, the readiness that people grasp at an aesthetically appealing visualization holds a lot of potential for conveying accurate info to the public to disseminate valuable knowledge but also presents plenty of opportunities to lead the public astray. Way to lay out the message succinctly and digestably. i agree, great post bill. nnEven in the medical world, we deal with this same problem on a daily basis. We are constantly presented with new studies and analyses evaluating new therapies and comparing existing treatments. As with the examples you presented above, the investigators may manipulate the data and present it in the way that bests suits their interest or what they hope the reader to get out of the study. That is why it is so important to approach everything you read critically and when appropriate, look at the raw data and draw your own conclusions. I think too often we take the easy road by simply looking at data from the author’s perspective when sometimes looking beneath the surface can expose potential discrepancies or alternative conclusions.nnVery interesting and broadly applicable post. i agree, great post bill. Even in the medical world, we deal with this same problem on a daily basis. We are constantly presented with new studies and analyses evaluating new therapies and comparing existing treatments. As with the examples you presented above, the investigators may manipulate the data and present it in the way that bests suits their interest or what they hope the reader to get out of the study. That is why it is so important to approach everything you read critically and when appropriate, look at the raw data and draw your own conclusions. I think too often we take the easy road by simply looking at data from the author's perspective when sometimes looking beneath the surface can expose potential discrepancies or alternative conclusions. Very interesting and broadly applicable post.